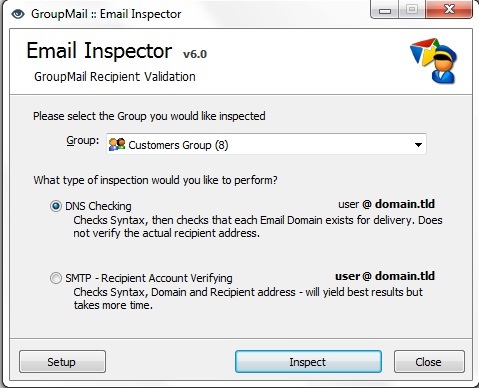 The GroupMail Email Inspector is an email verification and validation tool that allows you to inspect, validate and verify each email address on your mailing list to see if they are valid and capable of receiving email. Invalid addresses found can be removed from your groups or updated. This will reduce the number of bounces generated while sending and improving the overall send speed. 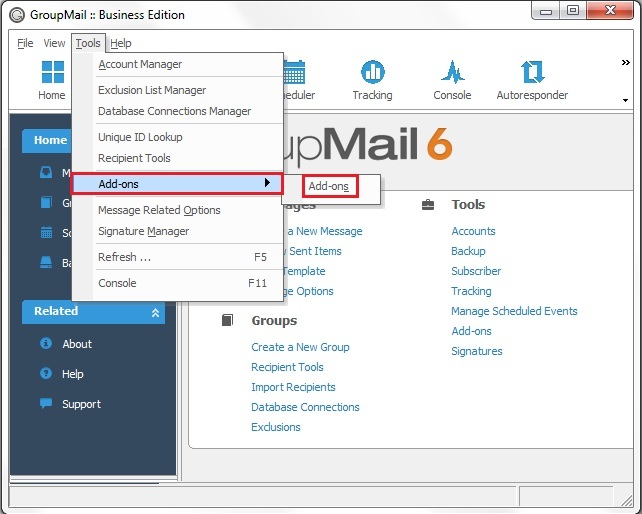 The Email Inspector Add-on comes installed with both the GroupMail Personal Edition or Business Edition and can be started from the Tools, Add-Ons Menu in GroupMail. There are two types of email verification tests available, DNS verification and SMTP verification. The DNS (Domain Name Service) verification test attempts to verify the domain name part of an email address (that’s the part after the @ symbol) to make sure that it is valid domain name and capable of receiving email. This type of test only checks the domain and not the actual recipient and because of this it is the fastest type of test but the least precise. * This test requires port 53 to be open on your firewall. The SMTP (Simple Mail Transfer Protocol) verification test attempts to verify the domain name (the same as the DNS test) and then tests the actual email recipient account by attempting to send a test email to them (note that no actual message is sent to the recipient.) While it is not completely infallible it is a lot more precise that the DNS test, but can take considerably more time to complete. The test requires the host email server to support real time user email verification. If this isn’t supported then it is possible that an invalid address might appear as valid. * Please note that the SMTP test can take as long to process as sending a message to that same group. Also, you should make sure not to abuse this as it generates traffic on each recipients email server. * This test requires ports 25 and 53 to be open on your firewall. Please note that some Internet Service Providers do not allow port 25 connections to hosts outside of their network. If you find when using this test that all of your email addresses “time out” in the test then it is most likely because of this. Please contact your ISP for more information. Should any invalid addresses fail to be identified by either test above you can catch them using the GroupMail Subscriber Add-on which is capable of parsing email bounces. Email verification setup options can be configured by clicking on the Setup button on the main screen. If you are going to use the SMTP verification option, you will need to specify an Email Address. This address will be used to identify you as the ‘attempted’ sender of the test message that is used to verify if a recipient exists. Please note that no actual message is sent. Also, make sure that you specify a valid email address here, otherwise your messages may be blocked before any test is carried out (especially if the ISP is checking things like SPF records). For best results the email address should match what you would use when sending a regular email. Some ISPs have restrictions on what email you can use. If this is the case then you should use the address they recommend (or restrict you to). If the domain you are sending from uses SPF (Sender Policy Framework) then you should make sure that your email/IP matches the details specified in the SPF record. Contact your ISP or network administrator for further details. Timeout SettingsDNS Timeout: this setting determines how long Email Inspector waits for a response from the DNS Server. This should be fine at 5 seconds.SMTP Timeout: this one determines how long the software will wait for a response from each SMTP Email server. 30 seconds to 1 minute should be fine.Timeout Retries: determines if Email Inspector will retry a request if it times out. If a connection times out then Email Inspector can retry it. This will make the test take longer (for larger groups) but it may allow you to improve your results. 1 to 3 is usually fine. Connection OptionsConnections: This setting determines the number of concurrent connections that are opened at the one time when testing. In theory the more connections that you open the faster you can perform the test.However this is dependant on the capabilities of your system and the resources available on it including bandwidth. We recommend that this is set at 10 for the majority of systems. If you find that you have a lot of time outs then you should reduce it as it is possible that the connections are competing with each other (and blocking each other).Notifications: This determines the frequency of status from each connection. The higher this setting the more items each connection will process before providing feedback. This can improve performance. We recommend a setting of 5 or higher. Typically the defaults on the Advanced tab should be more than adequate for most users. Settings can be changed at anytime. Click OK to save settings or cancel to revert to the last saved set. Then choose the type of test you wish to perform. The fastest test is the DNS one but it’s results are weaker. The SMTP email verification test is the best one but it is considerably slower than the DNS test. When you have selected a group and a test type to perform just click on the Inspect button. When Email Inspector completes a verification test, three results tabs are displayed. The details on each tab can be deleted, modified, printed or saved. The three results tabs are Failed, showing those addresses that have failed the chosen test; Verified, showing those that have passed and Other which includes those where no result was determinable. Email addresses that are not verified and confirmed invalid will be shown on this tab. In this example an SMTP test was carried out and 2 addresses failed. The status shows why each failed. Typically addresses that appear here can be deleted. We recommend that you review each of them to make sure that they haven’t failed for temporary reasons (like Mailbox Full) or spelling mistakes (which should be edited and retested). test@no_such_domain.com fails because no_such_domain.com doesn’t actually exist. The reported error/status in this case Invalid domain. A similar response is No Mail Exchange for Domain – this occurs if the domain isn’t configured to accept email, it might just be a website for instance. no_such_user@infacta.com fails because no_such_user does not have an infacta.com email account. The reported error/status in this case is Recipient rejected. The domain name part of the email address doesn’t exist. This is a permanent error and recipients with this error should either be edited (use the Modify option and enter a new address for them) or deleted. The domain name isn’t configured to receive email. Either it hasn’t been fully setup yet or the domain is not intended to be used for email. We recommend leaving these in the group unless you know that they are invalid. If you send to these addresses and the messages bounce the Subscriber Add-on can be used to process them. The user specified by the email address doesn’t exist. This will occur if the user no longer has an account with an ISP etc. These can be deleted or updated. This is a temporary error that can occur if a user goes over quota (has too many messages in their account). We do not recommend you delete these from here. We recommend that you use the Subscriber Add-on to process them as soft bounces (at least 5). If an address here has an obvious mistake in it (like a misspelling) then you can select it (by clicking on the check box beside it) and then by clicking Modify. Update as required and click OK to save the changes. When the address is saved it will be moved to the Other tab and it’s status will be updated. Select “Exclude this recipient from future mailings” – this will exclude them from being included in any mailing to the group you are testing. If you wish to exclude them from all groups (which is probably a good idea if the address is invalid) then you should enable the Apply to all Groups option. If you wish to remove the address completely (there is no undo for this!!) you should select the Delete this recipient option. Click Yes to apply your choices. If you are doing a DNS test then if the domain exists the test ceases and is successful. For instance the address no_such_user@infacta.com would have passed a DNS test because infacta.com is a valid domain and exists. With an SMTP test the address passes if the host mail server agrees to accept the attempted test message to the target recipient. At this stage Email Inspector cancels the transaction and no message is sent. Please note that some email servers will not verify that a recipient email address exists until later, as in after you submit it for delivery (there are a number of reasons why this might be the case including how busy the server is or for fear of being the target of a dictionary attack by spammers). If this is the case then some of the email addresses that pass this test may actually be invalid. This will become apparent when you send a mailing to this group as you will receive bounces. These bounces can be automatically processed using the Subscriber Add-on. If Email Inspector cannot verify if an email is valid or not it will place it on this list. Most typically, email addresses will get listed here because the test timed out (a busy connection might cause this or a firewall mis-configuration). If you choose to modify an address on either of the other tabs it will also appear here (so as to avoid being classified as a failed or verified address until retested). Could not verify recipient – this response covers a number of possibilities ranging from software and network errors to invalid responses from the server being tested. Unexpected error – an undocumented temporary protocol error. Unknown level (10048) – this is a local response that can occur if more than one connection attempt to open the same local port. Connection refused (10061) – like the Try again message this one typically happens if a server is busy and unable to accept any connections on port 25. The server may also be down. Connection reset (10054) – this response can occur if the connection to the server times out or is dropped because the server reboots. Try again (11002) – this occurs if the server being asked to verify a domain is busy or unable to take any more connections. The Connection refused response can also occur for this reason. Typically you should take no action on addresses that appear in this list. Save and Print allow you to make a backup of your test results. However it is recommended that you backup all of your data before using Email Inspector. The Backup Add-on should be used for this task. If you have any questions regarding either please do not hesitate to contact GroupMail Technical Support. Interested? Get your mailing list cleaned up and verify your email addresses with GroupMail.